WASHINGTON, D.C. -- Americans' confidence in an array of U.S. societal institutions is holding steady in 2018, with the military continuing to earn the highest confidence of 15 institutions tested. Small business and the police retain their second and third place rankings, and Congress continues to rank last -- consistent with the patterns in recent years. Now I am going to read you a list of institutions in American society. Please tell me how much confidence you, yourself, have in each one -- a great deal, quite a lot, some, or very little? This year's update of Gallup's longstanding Confidence in Institutions question was conducted June 1-13. The question, first asked in 1973 as the Watergate scandal was unfolding, asks Americans whether they have a great deal, quite a lot, some or very little confidence in each institution, and ranks them on the basis of the combined great deal and quite a lot scores. The 2018 Confidence in Institutions ratings are broadly similar to a year ago, but with a few notable shifts. Confidence in the church or organized religion is down three points to 38%. This is another all-time low for an institution whose highly positive image has been shrinking since its peak 68% great deal/quite a lot confidence rating in 1975. The church had been the top rated institution in the 1973-1985 surveys. The last year a majority of Americans expressed high confidence in the church was 2009. As low as confidence in the church has sunk, it is still one of the nation's top rated institutions and has higher positive than negative ratings, with 27% of U.S. adults saying they have very little or no confidence in it. Also notable this year -- confidence in big business edged up to 25% from 21% a year ago and is the highest for this institution since 2001. Several institutions -- public schools, the criminal justice system, newspapers and television news -- all saw slight declines in their confidence ratings this year, returning them to their 2016 levels after increasing in 2017. Meanwhile, organized labor and banks have both maintained most of their 2017 gains. As a result, labor continues to enjoy higher public esteem than it has since its confidence rating peaked at 31% in 2004 while banks remain at their highest since right before the 2008 Wall Street financial crisis. Confidence in the presidency increased five points this year to 37%, consistent with the five-point increase in President Donald Trump's job approval rating between the two polls. The average level of confidence Americans express in the 14 institutions rated consistently since 1993 -- all those measured this year except for small business -- is 33%. That is down slightly from the average 35% recorded in 2017 but matching the average over the past decade. The average was higher prior to the 2007-2009 recession, ranging between 38% and 43% from 1997 through 2006. It had been slightly lower than that during the mid-90s as the country was recovering from the 1991 recession. 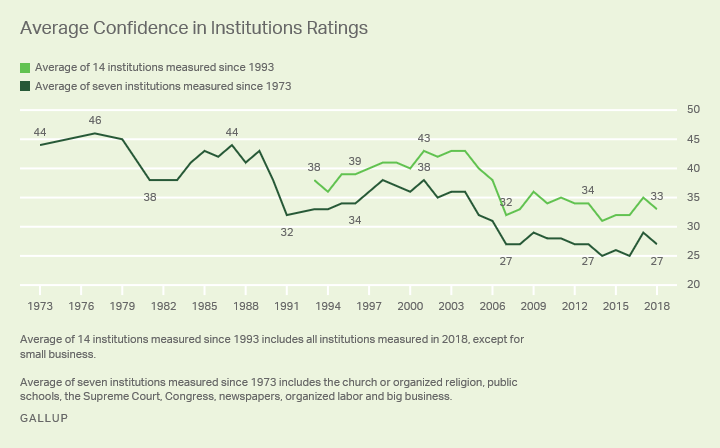 Focusing on the smaller number of institutions that Gallup has measured since 1973 shows the longer-term decline in confidence. The average confidence expressed in these seven institutions (the church or organized religion, public schools, the Supreme Court, Congress, newspapers, organized labor and big business) was 44% in 1973, falling to 32% by 1991 and 27% today. At least for the time being, Americans' average confidence in the nation's major governmental, economic and societal institutions has leveled off at a historical low point. However, while low relative to the past, confidence is not entirely absent. The military, small business and the police still receive high confidence ratings from a majority of Americans, and most other institutions garner at least "some" trust. Congress, the media (both television and print), and the criminal justice system -- all entities facing significant scrutiny in the news or across social media in recent years -- receive much higher negative than positive confidence ratings, serving as the poster institutions for what Americans think is wrong in the country. 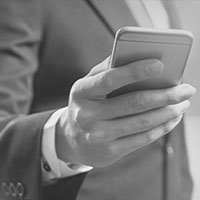 Low confidence in these may also be contributing to Americans' continued high dissatisfaction with the direction of the nation in spite of an improving economy.